(TibetanReview.net, Aug27, 2016) – The Central Tibetan Administration (CTA) at Dharamshala is to make unprecedented security arrangements and also extra efforts to ensure the welfare of the needy devotees during the 34th Kalachakra teachings by His Holiness the Dalai Lama which it is organizing at Bodh Gaya over Jan 3-14, 2017. The organising committee, with the cooperation of the government of Bihar state, is paying particular attention to all the details including security, Kalon Karma Gelek Yuthok, the committee’s chairman and the CTA’s Kalon (Minister) for the Department of Religion and Culture, said at a press conference Aug 25. The Security arrangement will focus on the safety of the public, the holy site and the person of His Holiness the Dalai Lama, said the CTA on its Tibet.net website Aug 25. “The state and district officials have been very cooperative and have promised to render whatever assistance that is not feasible from the part of the organising committee (will be needed). And we are deeply thankful for that,” Kalon Karma Gelek Yuthok was quoted as saying. He explained that the CTA Will go out of its way to make it possible for the poor and needy Tibetans desirous of attending the teachings to be able to make it to Bodh Gaya. 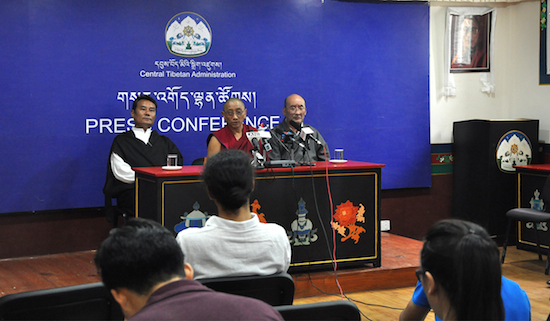 The measures include the department of education sponsoring destitute Tibetan children to attend the teachings and the Department of Home sponsoring destitute Tibetan individuals and families, and the department of religion and culture extending the same assistance to Tibetan hermits and yogis.